Bandit Industries is an innovative, dedicated team focused on building lasting relationships with our dealers and customers. We will achieve this by delivering premium wood and waste processing equipment and services, on-time at a competitive price inspiring customer enthusiasm. This will provide long-term profitable growth and personal achievement for our employees, dealers and customers. Honesty and Integrity - We hold ourselves to the highest integrity and ethical behavior and deliver what we promise. We strengthen our reputation through trust. Our dealers, customers, suppliers, community and employees must be able to trust what we say and be confident that we will keep our commitments. Performance Excellence - Bandit’s dedication to quality, performance and customer support is what differentiates us from the competition. It is our employees personal pride and customer focus that continuously drives us to improve our processes and the products and services we provide. Our continued success depends upon addressing the needs of our employees and exceeding the expectations of our dealers and customers. Teamwork - Bandit’s diverse set of talents, thinking and opinions is what makes our team strong. We respect and value differences in opinions, experiences and backgrounds. We know that only by working together, we can we produce better results than any one of us can achieve on our own. Commitment - We make meaningful commitments to each other and those with whom we work and serve. We are committed to providing a safe, personally satisfying work environment for our employees. The commitment we share is essential to meet the needs of our dealers and customers. It is our duty to carry forward the Bandit legacy. Bandit’s Mission Statement and Core Values stem from the very beginning, when Mike Morey Sr. left a prominent position with one of Bandit’s main rivals because he believed he could build a better product. Pressure mounted from top management to scrap ideas Morey felt were sound, and to implement changes that went against his judgement for what a good product should be. Mike finally had enough in 1983 and with the support of his wife (and Bandit co-founder Dianne) and their children, he started a small company called Foremost Fabrications. He procured a 6000 square-foot repair shop located in a rural field approximately 10 miles west of Mt. Pleasant, Michigan. 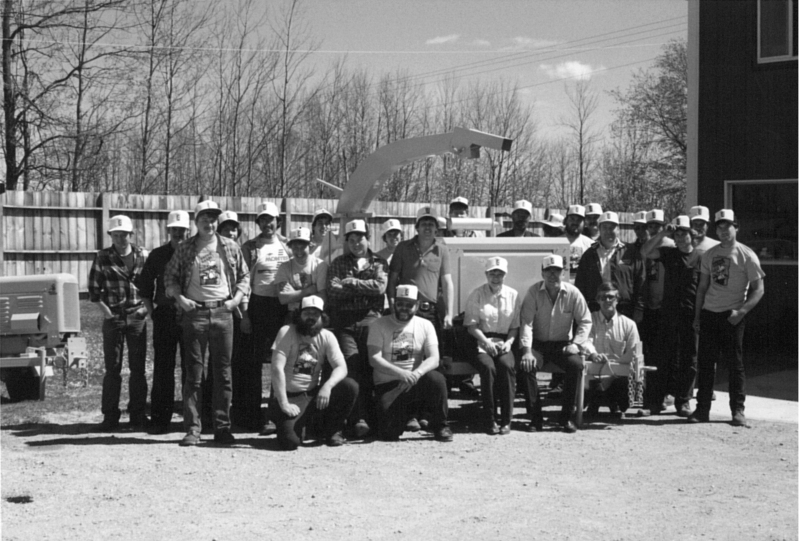 He had the assistance of six employees, and using the designs his previous company had rejected, Mike and the fledgling team built the first Brush Bandit® chipper – the Model 100. Sticking to Bandit’s mission and core values, Morey hit the road to promote the new chipper. Aside from the innovative design with the now-famous Slide Box Feed System, he pledged honesty, integrity and unwavering support as part of the Bandit ownership experience. It didn’t take long for before the first load of Bandit chippers hit the road. In 1987 Jerry Morey and Dennis Tracy left the same rival company to join Mike and Dianne as co-owners, bringing significant experience in sales and marketing with them. The company name was officially changed from Foremost Fabrications to Bandit Industries, and things took off. 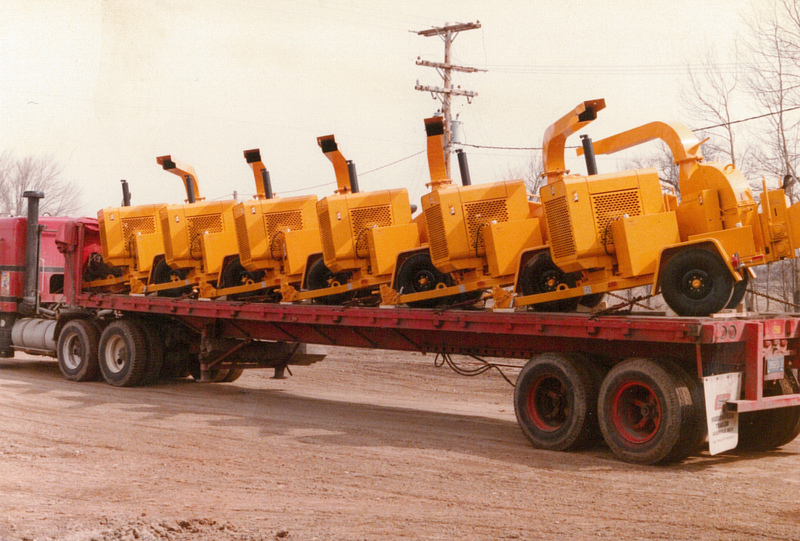 Bandit Industries pioneered the self-propelled chipper market by introducing the first track chipper in the early 1990s. A few years later Bandit unveiled The Beast® – a powerful horizontal grinder that would soon become one of the leading machines in the world for processing waste wood, plastic, roofing shingles, rubber, and so much more. Bandit developed a line of stump grinders in the 2000s, followed by track carriers featuring interchangeable forestry mower and stump grinding heads. In 2013 Bandit unveiled a line of skid-steer attachments for land clearing operations. As the product lines grew, so did the manufacturing capability. 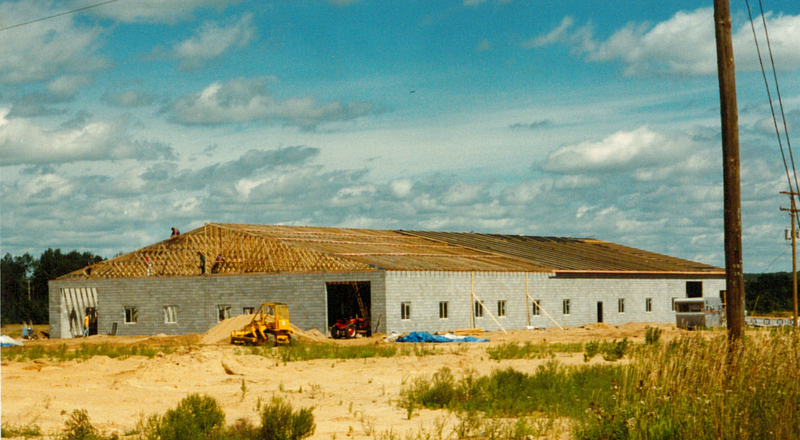 Averaging a major building expansion every two years, Bandit’s original 6000-square-foot shop grew to over 280,000 square feet of manufacturing space at two locations in mid-Michigan. To assist customers and serve as brand ambassadors, Bandit’s dealership network has expanded to over 200 locations around the world. All total, there are more than 400 Bandit employees involved in design, assembly, paint, electrical, sales, marketing, and ship-out. All this was possible because Bandit’s core mission and values have not changed. Build premium equipment. Build and maintain strong, lasting relationships. Hold to the highest level of honesty and integrity. Remain dedicated to performance excellence across all fronts. Build additional strength through teamwork and partnerships. Always honor commitments, both within the company and outside with customers. In 2018, Bandit Industries' owners announced that they would sell 100 percent of the company to its employees through an Employee Stock Ownership Plan (ESOP). This move ensures that the same culture that has made Bandit a success for the past 35 years will remain unchanged! It’s been a great journey so far. And the best is yet to come.